We offer a wide range of Industrial Aluminum Wires which are manufactured using quality raw materials used in diverse industries. Available in different gauge and alloy. 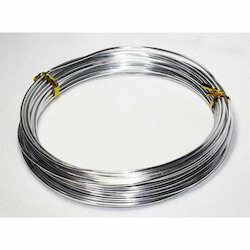 Industrial Aluminium Wires are widely used in communication cables, Flexible cables, Coaxial cables, Wire used electrical appliances, Aluminum pads, Anodic treatment, Water-bottle carrier, parcel grids for bicycles, Ornamental chains for costume jewelry, Mosquito nets. Looking for Aluminium Wires ?